Prep jars/lids for canning. Place the plums into a large, heavy bottomed pan. Add the sugar. Bring to a boil, stirring until it begins to reduce and thicken. Stir in the pectin. Continue cooking at a low (rolling) boil for 2-3 minutes or until it looks thick and jammy. Fill the jars leaving 1/4 inch headroom. Process in the hot water bath for 10 minutes. Yield: about 4 8-oz jars. When Matt came home from our local farm store saying he had bought some mysterious little yellow plums we were both intrigued. 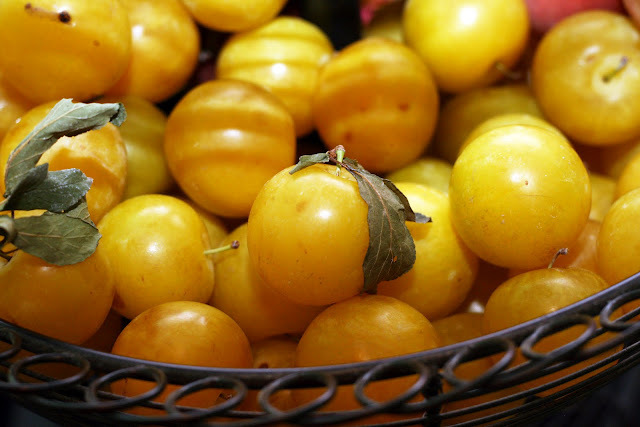 They were so sweet and juicy and unlike any plum we had seen in the stores or farmers market before. A little sleuthing revealed that they were mirabelle plums. While they can be grown here, there are some what rare and mostly grown and eaten in France. Apparently in the Lorraine region of France they are made into two things: jam and eau-de-vie, a type of fruit brandy. 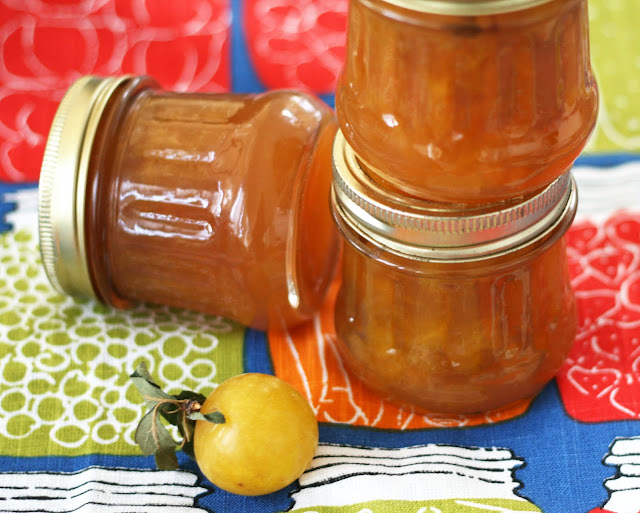 Since I am not set up to make my own brandy, I thought I'd make jam. I looked for jam recipes online but 95% were in French and used the more "casual" European approach to jam making. I thought I'd share what I did to make this French jam in the American, FDA-approved, more sterilized way. Now I know these plums can be tricky to find but they are worth seeking out. They are perhaps, the best plums I've eaten and the jam is unparalleled. I think your best bet for finding them (if you don't have a tree yourself) is a farm store, pick-your-own farm, gourmet grocer or farmers market. Good luck!